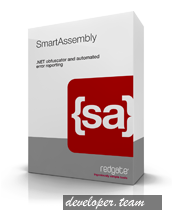 SmartAssembly is a .NET obfuscator, error reporting, and feature usage reporting tool designed to help .NET developers produce better quality applications. This all-round solution will obfuscate and protect your .NET code, and add powerful error-reporting and feature-usage reporting capabilities to your application. Worried about other people reverse-engineering your software? Obfuscate and protect your code before releasing it into the wild. About to ship a new version of your software but not sure how it will fare in the field? Get error reports on your beta product, fix bugs, and build a reputation for delivering robust software. Wondering which platforms you need to support, or which features you should concentrate your development efforts on? Receive feature usage reports to help prioritize your work.